Back in January 2015 on Australia day I exceeded over 300g carbs and it knocked me out of Nutritional Ketosis and I felt all the tiered affects been off the Island of Nutritional Ketosis? As you know I measure my Blood Ketones and Sugar levels daily I wanted to share with you that after a cheat day it took my body almost 7 days adapt back into the Nutritional Ketosis zone. I have seen some many people doing LCHF have a cheat day once a week and if your doing this remember you may only be on the island for a couple of days and not really having a chance to enjoy the benefits of living on Nutritional Ketosis. This is mainly because the stored glycogen in the liver and muscles are dealing the with the stored glucose fuel first once completed it will start producing more ketone for energy. 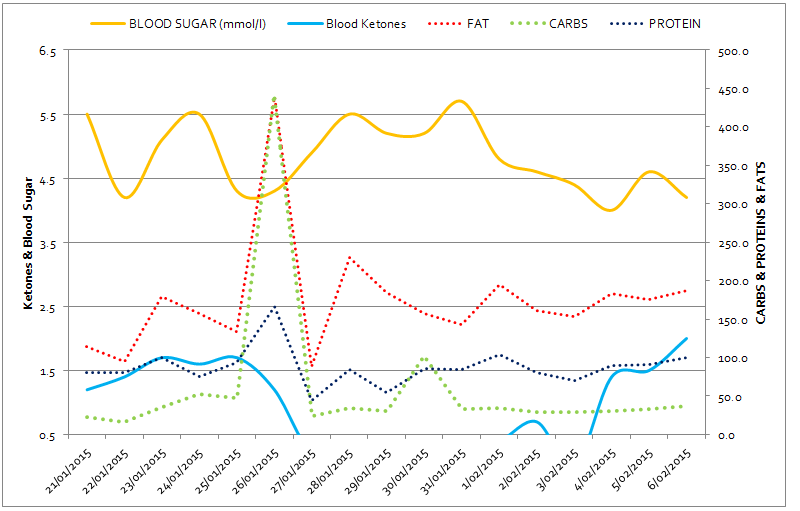 The Blue Line at the Bottom Shows Blood Ketones going under 0.5 and falling off the chart.